Or in other words have a point. I’m going to repeat that because it’s a lesson I find myself relearning often: Have a point. I need to have something to write more than I need to write something (if that makes sense). Corollary for bloggers: Don’t feel guilty about writer’s block. RSS Readers and Link Followers: Yep, that’s you! (both of you). You enjoy keeping up with SQL Server industry news by following various SQL Server blogs including this one. Something piqued your interest about the title and you started reading (btw, thanks for reading this far!). Writing clearly goes back to having a point. If a sentence, word or paragraph does not help your point then it probably doesn’t belong. When you omit the unimportant stuff, what’s left is packed with meaning. One trick I use is to do a brain dump. I quickly type an outline of what I want to write so that I don’t forget anything. Often this simple outline gets included into the post verbatim. Well written… which is good because you don’t want to write a load of crap about writing. A lot of the same principles also apply to speaking, either professionally speaking or even casual conversation. Just something I wish for as I think about the many babblers I’ve come across in my travels. 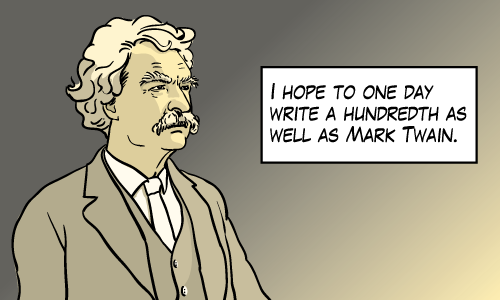 Holy cow but that’s an awesome image of Mark Twain – definitely like the definition in the wrinkles. Thanks Brian, I think you’re right about presentations. I don’t do a lot of them. But I imagine the same things apply. Do a search and replace on this article. Change “write” to “speak” and change “reader” to “audience” and you’re there. I do not think anyone who reads Dylan Thomas can be bad at writing–certainly your posts evince the contrary! Thanks for the compliment Claire. I appreciate it. 🙂 Merry Christmas!